What’s On Magazine March 2019 edition features our pictures from the 72nd British Academy Film Awards at The Royal Albert Hall, London. The winners of the EE British Academy Film Awards have been announced at a ceremony hosted by Joanna Lumley at the Royal Albert Hall, London. What’s On Magazine was invited attended this red carpet event which honours the best national and foreign films of 2018. A Star Is Born won Original Music and Vice took the BAFTA for Editing. 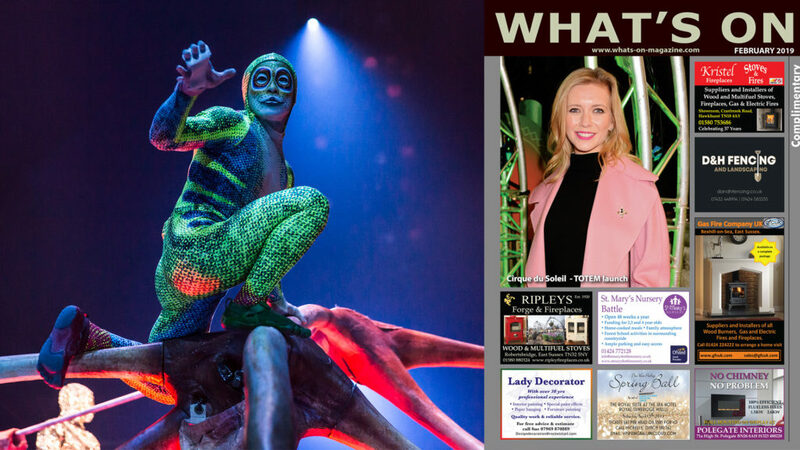 What’s On Magazine February edition features pictures from the London premiere of Cirque Du Soleil’s London show Totum. The show continues at The Royal Albert Hall London until 26th February. Their Royal Highnesses The Duke and Duchess of Sussex attended Cirque du Soleil’s premiere of TOTEM at the Royal Albert Hall to raise vital funds and awareness for The Duke’s charity, Sentebale which helps youth affected by HIV in southern Africa. The very special evening saw guests grace the red carpet and enjoy an awe-inspiring performance from the cast of TOTEM. Attendees included Sir David Jason, Sir Matthew Pinsent, Dame Kelly Holmes, Dame Esther Rantzen, Katherine Jenkins, Edith Bowman, Amber Le Bon, Danny Dyer, Claude Littner, Didi Conn, Jon Culshaw, Julia Davis, Kara Tointon, Hannah Tointon, Joe Thomas, Kelly Brook, Fiona Bruce, Rachel Riley, Victoria Pendelton, Christopher Dean, Alistair Petrie, Beverley Knight, Candice Brown, Sentebale ambassadors Laura Main and George The Poet, alongside Sentebale supporters Victoria Yeates and Laura Wright and many more. Since its Montreal World Premiere on April 22, 2010, TOTEM has been performed over 2,800 times in more than 45 cities. 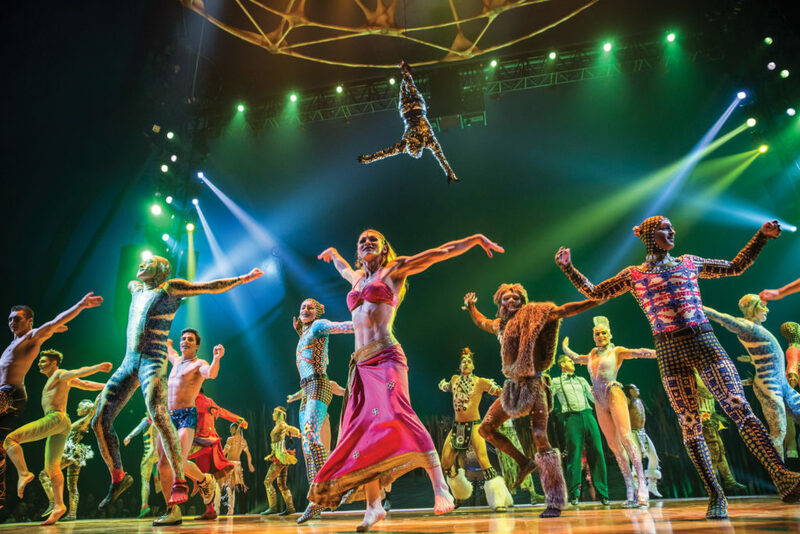 Approaching its 10th successful year of touring, to date, more than 5 million audience members have been mesmerised by the production. Written and directed by Robert Lepage, TOTEM features a cast comprised of 46 acrobats, actors, musicians and singers hailing from 19 countries: Australia, Belarus, Brazil, Canada, China, Czech Republic, France, Finland, Germany, Italy, Japan, Kazakhstan, Moldova, Mongolia, Russia, Spain, Ukraine, United Kingdom and United States. This evening’s premiere, presented in partnership with Sentebale, marked the second event in a series of ‘Sentebale Nights’, building on the success of the charity’s first production with the hit musical HAMILTON in August 2018. Founded in 2006 by The Duke of Sussex and Prince Seeiso, Sentebale helps the most vulnerable children in Lesotho, Botswana and Malawi – the victims of extreme poverty and the HIV/AIDS epidemic – get the support, tools and education they need to lead long, healthy and productive lives. Lesotho and Botswana have the second and third highest prevalence rates of HIV in the world respectively. Sentebale works in these two countries delivering youth-appropriate HIV prevention solutions and weeklong residential camps and monthly Saturday clubs for those coming to terms with living with HIV. Sentebale reaches over 4,200 children and young people each month in Lesotho and Botswana through clubs, and last year delivered comprehensive sexuality education to 100,000 adolescents through school and community outreach projects. In October 2018, Sentebale expanded into Malawi with the pilot programme ‘Mawa Girls’ in partnership with the Global AIDS Interfaith Alliance (GAIA). In southern Africa, three out of four new HIV infections in 15-19-year-olds occur among young women, and seven in ten young women lack knowledge about HIV (UNAIDS, 2018). Keeping girls in school is a proven protective factor against HIV; when girls stay in school, they have lower rates of early marriage, pregnancy and HIV infection. Mawa Girls, the word ‘mawa’ meaning ‘tomorrow’, builds on GAIA’s secondary school bursary programme by incorporating our model of psychosocial support through camps and clubs. The curriculum focuses on life skills training, include encouraging girls and young women to stay in school, HIV prevention and sexual health and wellbeing. Sentebale currently reaches 360 girls each month in clubs and plans to run four camps in 2019 for 120 of those clubbers. Tickets are on sale now, and for a truly unforgettable Cirque du Soleil experience a collection of premium and VIP experiences for all the family are also available. Tickets can be purchased through the Cirque du Soleil website or www.royalalberthall.com or 020 7589 8212. TV and radio personality Fearne Cotton has launched her limited-edition debut collection with Cath Kidston, spanning across fashion, accessories and home, to mark a first for the retailer, who has never before collaborated with a celebrity. Launched at the Vinyl Factory in London’s Soho, the Fearne @ Cath Kidston collection features the iconic Cath Kidston archive print, Hampstead Ditsy, alongside motifs that Cotton “holds dear,” including references to her children, Honey and Rex, with sketched honeybees and a t-rex dinosaur, as well as feel-good motifs and astrology, all of which were hand sketched. 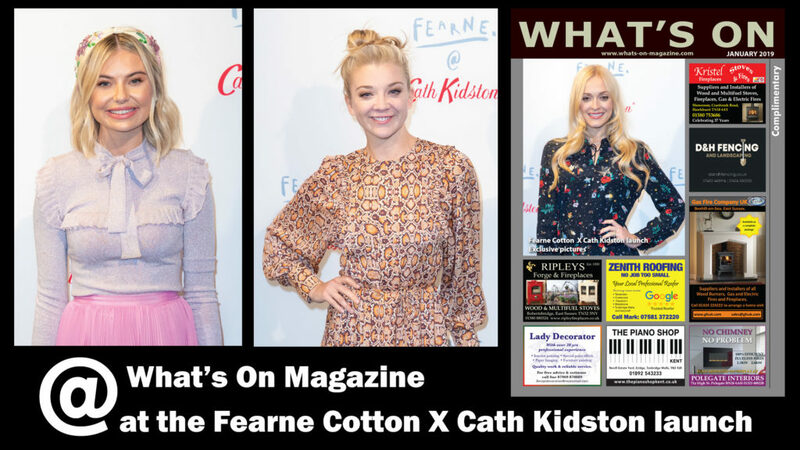 Commenting on the launch Fearne Cotton said in a statement: “It was great fun celebrating the launch of my new collection with Cath Kidston alongside all my friends and family. The new 34-piece collection features new shapes and styles for Cath Kidston including a Boilersuit made in a super soft chambray fabric, a statement Bomber jacket featuring a tufted planet and embroidered stars with ‘You are my Universe’ emblazoned on the back, and new canvas totes with cheeky slogans such as ‘Carry Me’. The highlight piece, which Cotton has stated on her social media as one of her favourites is the flattering ‘The Fearne Loves Midi Dress’ which features the exclusive Fearne print with an intricate overlay of sequin embroidery showing shooting stars. Other fashion and accessories pieces includes a ‘Bee Happy’ sweatshirt, playful printed shirts, a reworked foldaway overnight bag, the bestselling shape for Cath Kidston has been re-imaged with the Fearne Loves print and rainbow trims. This collection also showcases new and original trims and techniques including tufted embroidery, metallic stitching and iridescent pewter hardware for accessories. In addition, there is a homewares collection that have been designed to “fill your home with positivity” including ‘Happy’ cushions and plates, an ‘All Good’ apron, and a ‘Hold it Together’ tea towel, all featuring the Fearne Loves print. There are also a number of gift options including the Fearne Loves Set of 2 Mugs, one featuring the Fearne Loves dinosaur print with ‘Calm’ written inside the mug, while the other is adorned with ‘All Good’ and a ray of sunshine on the outside. The Fearne @ Cath Kidston range is available in selected Cath Kidston stores and online, with prices ranging from 8 pounds for a luggage tag or zip purse to 95 pounds for the bomber jacket. Cath Kidston will be following up its collaboration with Cotton with a new Disney collection celebrating Mickey’s 90th anniversary, which launched last month. 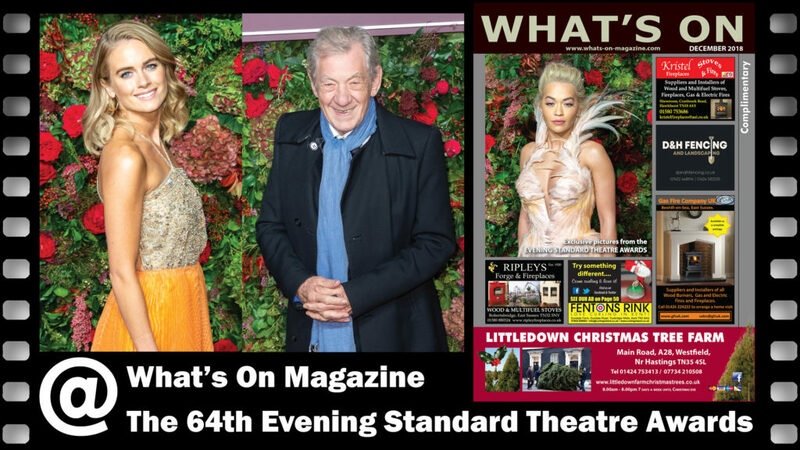 What’s On Magazine December 2018 is out now with our exclusive pictures from The 64th Evening Standard Theatre Awards. You will also find a comprehensive list of forthcoming events for December in your local area as well as many London exhibitions. Pick up a copy at one of our many local distribution points including major supermarkets or read online now. The winners of the 2018 Evening Standard Theatre Awards were revealed at a recent ceremony at London’s Theatre Royal, Drury Lane. A radical revision of Stephen Sondheim’s and George Furth’s Company won Marianne Elliott the Milton Shulman Award for Best Director. She switched the gender of the leading man to a woman, giving Rosalie Craig the role of a lifetime and the Evening Standard Award for Best Musical Performance. The West End’s other unstoppable musical, Hamilton, also won two awards. Lin-Manuel Miranda’s hip-hop history, which opened last December, was named Best Musical. Its London star Jamael Westman was presented the Award for Emerging Talent. This year’s Lebedev Award went to Sir Cameron Mackintosh, a co-producer of Hamilton and owner of its London home, the Victoria Palace Theatre, for his contribution over 50 years to musical theatre. Nine Night, a tragi-comedy about a family gathering on the final night of the traditionally Caribbean mourning period, earned first-time writer Natasha Gordon the Charles Wintour Award for Most Promising Playwright. The award comes with a generous donation made by Dame Anna Wintour, American Vogue editor-in-chief and Artistic Director of Condé Nast. As an actress Gordon, 42, has had roles in previous Evening Standard Award winners, Red Velvet and Clubland, and her TV work includes Law and Order and EastEnders. She will take over the starring role in Nine Night when it transfers to Trafalgar Studios next month. The annual awards, marking the 64th year, were hosted by the Evening Standard owner, Evgeny Lebedev, with co-hosts Dame Anna Wintour, Claire Foy and Idris Elba. Fleabag and Killing Eve writer and actress Phoebe Waller-Bridge returned for the second year to present the ceremony. The individual awards were presented by Idris Elba, Claire Foy, Andrew Garfield, Richard Madden, Stella McCartney, Jenna Coleman, Letitia Wright and Paapa Essiedu, Patti LuPone and Bee Carrozzini. In an extraordinarily successful year of West End transfers and extended runs, five of the productions to have won Evening Standard Awards this year can still be seen. Antony and Cleopatra is at the National’s Olivier, until 19 Jan; Company is booking at the Gielgud, WC2 until 30 Mar; Hamilton continues at Victoria Palace, SW1; The Inheritance is at Noël Coward, WC2 until Jan 19; and Nine Night transfers to Trafalgar Studios, SW1 from 1 Dec until 23 Feb. Among three live performances on the night Jonathan Bailey and cast members of Company performed Getting Married. Sharon D. Clarke also sang Lot’s Wife from Caroline, or Change, the musical she is currently starring in at the Playhouse Theatre, and Michael Jibson performed King George’s song, You’ll Be Back, from Hamilton. In addition to the awards presentations, the first in what promises to be an annual tribute was made to Behind-the-Scenes Heroes of theatre, dedicated on this occasion to the dressers, in partnership with Maison Margiela. Designer John Galliano introduced it with a speech in which he revealed that he started his working life as a dresser at the National Theatre after finishing at St Martin’s School of Art. He invited 26 dressers seated in the auditorium to join him on stage to take a bow. The official After-Party, in association with Michael Kors, followed the awards ceremony and was hosted by Evgeny Lebedev with co-host Cressida Bonas. GUESTS INCLUDED: Dame Anna Wintour, Claire Foy, Idris Elba, Evgeny Lebedev, Phoebe Waller-Bridge, Ralph Fiennes, Andrew Garfield, Sophie Okonedo, Jenna Coleman, Letitia Wright, Stella McCartney, Richard Madden, Sir Andrew Lloyd Webber, Dame Shirley Bassey, Cressida Bonas, Bee Carrozzini, Paapa Essiedu and Douglas Booth. The GQ Men Of The Year Awards 2018. You will also find a comprehensive list of forthcoming events for November in your area as well as many London exhibitions. 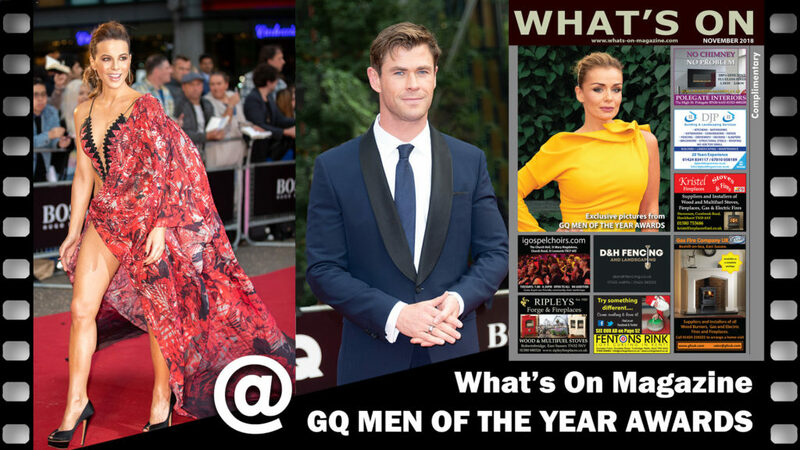 The GQ Men Of The Year Awards is one of the most glamorous events on the calendar, with an eclectic mix of icons, superstars & tastemakers celebrating the inspirational men and women of the last 12 months. The GQ Men of the Year Awards 2018, now in its 21st year, took place at the Tate Modern in London and celebrates the men and women who shape the world’s cultural landscape over style, politics, entertainment and sport. At this year’s awards guests enjoyed canapés and a three-course dinner by Michelin-star chef and GQ Food and Drink award winner, Paul Ainsworth, alongside a selection of whisky cocktails provided by Haig Club. Known for his bold flavours and taking advantage of the best produce Cornwall has to offer, Ainsworth’s dinner began with Cornish gin-cured salmon, followed by a main course of aged soy-glazed ox cheek and finished with a vanilla panna cotta with strawberries, hibiscus, honeycomb and hazelnuts. To compliment the menu, Haig Club served stylish cocktails such as the Haig Clubman Boulevardier (Haig Clubman, Belsazar Rose Vermouth, Italian bitter aperitif, orange twist) and the Haig Club X GQ Cooler (Haig Club, elderflower, Fever-Tree Ginger ale, fresh cucumber). These are the very worthy winners of 2018, including Prince Charles, Rose McGowan and many more. Johnny Marr, John Legend, Dua Lipa, Olly Alexander, Paul Weller and Jorja Smith were among the music artists who won prizes. Legend and Marr also performed at the event. 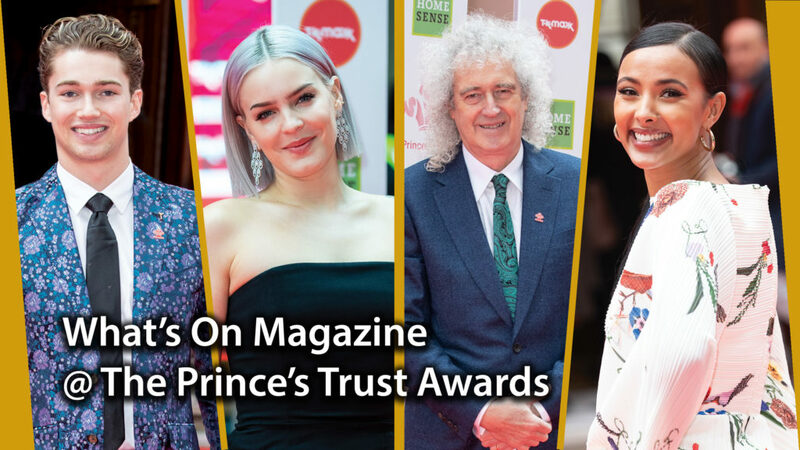 The Smiths co-founder Johnny Marr received the Lifetime Achievement Award, John Legend was named Hugo Boss Most Stylish Man, Dua Lipa was given the Solo Artist Award, Olly Alexander was honored with the Live Act Award, Paul Weller received the Songwriter Award, and Jorja Smith was named Vero Solo Breakthrough Artist. Other winners were Prince Charles, who received the Editor’s Lifetime Achievement Award for Services to Philanthropy; actor Chadwick Boseman (International Man); comedian/actor Sacha Baron Cohen (Editor’s Special Award); fashion designer/mogul Donatella Versace (Designer); model/actress Naomi Campbell (Fashion Icon), actress Elisabeth Moss (TV Actor); fashion designer Philipp Plein (Brand); Daniel Kaluuya (Actor); and actor Jeff Goldblum (Haig Club Icon). Activist, director and author Rose McGowan is the first woman to receive the Inspiration award at the annual ceremony. Other attendees at the star-studded event included Kylie Minogue, Rita Ora, Zendaya, Diplo, Tom Hiddleston, Chris Hemsworth, Chrissy Teigen and Kate Beckinsale.